Holly Portier has been a member of the Junior League since 2008. She has served as IBCI Coordinator for CSE/HT and Chair of the CSE/HT Committee. In the community, she has served on the board of directors for The Suthers Center for Christian Outreach and The Atlanta Hospital Hospitality House. She presently serves on the vestry of St. Martin’s Episcopal Church and is the senior warden. Holly Portier attended the State University of West Georgia and graduated with a BA in English in 2001. 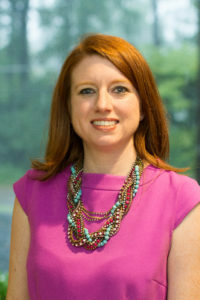 She taught high school English for four years and then obtained her law degree from Georgia State University in 2008. She is a partner with Hamilton, Westby, Antonowich & Anderson where she practices workers’ compensation defense. She is married to Bailey Webb and has a son, Ted. Holly enjoys running and watching Game of Thrones but not simultaneously.